The 20-foot Donald Trump baby blimp, which entertained Londoners last week, will be making its way stateside by mid-August. The plan is to fly it over Trump National Golf Club in Bedminster, New Jersey, where the flesh-and-blood Trump baby enjoys playing golf when he’s not busy mortifying his constituents to unprecedented levels. 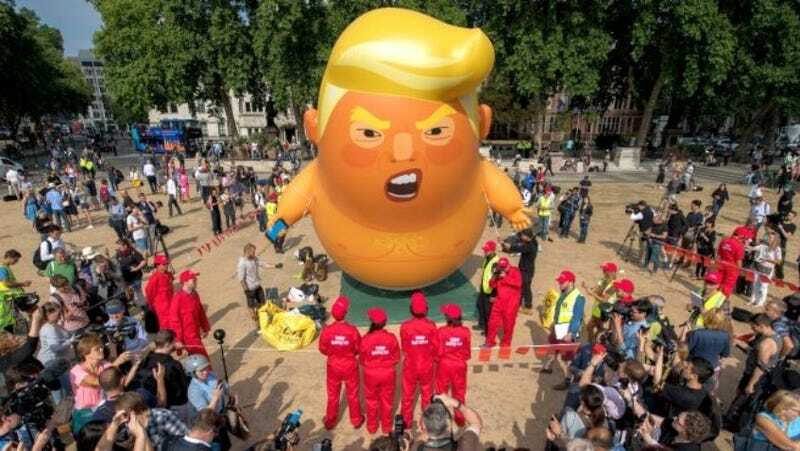 Blimp Trump (henceforth Blump), which is actually way more comely than the person it depicts, was so popular in England that New Jersey activist Didier Jimenez-Castro launched a GoFundMe to bring it over here. He set a fundraising goal of $4,500, which was reached in a snappy 22 hours. Because Trump’s reaction to criticism is more reliable than a Volvo driven by one of Mr. Rogers’ sweaters, the real baby decided to avoid London because his feewings were huwt. If all it takes to make Trump avoid a place because he feels unwelcome is freakin’ blimp, why aren’t we working night and day to crank out as many of these things as possible? Let’s get them shits everywhere, flying over the White House, lurking over every street corner in New York City—hell, on every street corner in America that’ll have one. Blot out the sun with Blumps; darken the skies with his big, bloated, squalling, idiot face. Other cities are also raising money for their Blumps, including Silver Spring, Maryland; Austin, Texas; St. Louis, Missouri; and Farmington, New Mexico. Four down, several million to go.